Put a healthy spin on a classic family favorite with this easy to follow recipe. We bumped up the nutrition and fiber content while reducing heavy creams, butter and fats to make this tuna casserole a healthy, cheesy, family favorite. Shhhh...don't tell your kids this is actually good for them! Preheat oven to 375 degrees. Spray a 9 x 13 glass dish with nonstick butter flavored cooking spray. Cook pasta according to package directions, cook until el dente (slightly firm). Drain pasta and set aside. Using the same pasta pot, melt butter and saute onions for about 5 minutes until soft. Sprinkle with flour and stir to combine. Slowly pour chicken stock into onion mixture stirring to dissolve flour. Pour in milk and bring to light simmer. Add peas and continue to simmer for about 5 minutes until liquid begins to thicken. Add canned tuna and stir. Remove from heat and add cheese. Stir until cheese melts. Season the cheese sauce with salt and pepper to taste. 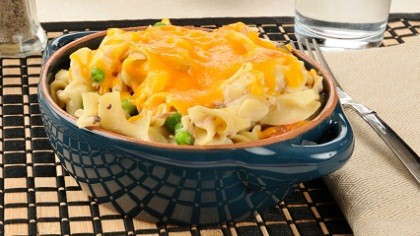 Fold the pasta into the cheese mixture and spoon into sprayed baking dish. Sprinkle with bread crumbs and Parmesan/Reggiano cheese. Bake for 20-25 minutes until bubbly. Broil for another few minutes to brown the bread crumbs on top.